Heat oven to 350ºF. Lightly grease bottom and sides of 15x10x1-inch baking pan with sides (jelly roll pan) with shortening or cooking spray. 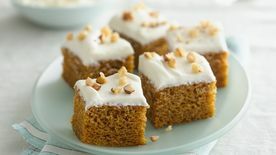 Variation: Add a bit of lemon zing to the cream cheese frosting by substituting lemon juice for the vanilla and adding 1 teaspoon grated lemon peel.